The concept of prayer flags partly originates from the culture of worshipping books, using scriptures in various forms. In ancient India, Buddhists treated books as an object of worship. They would write the books, store them in special receptacles and venerate them. Books were written on palm leaves or birch barks but when Buddhism reached, the books were written on paper, clothes, wood, metal plates and stone. Short sutras were carved out on cliff faces, rocks and walls. People believed that they accumulated merit by producing religious books. This practice of producing and using books for merit-making was also later applied to the medium of flags. It was an innovative way of spreading the teachings of the Buddha or their blessings by harnessing wind power. The tradition of hoisting prayer flags perhaps started with such spiritual background and intention. Today, in Bhutan there are many kinds of scriptures written on cloth and put up on a pole vertically. In Tibet, where there are fewer trees, they print prayers on cloth or paper in square forms and hang them on ropes horizontally. The prayers come in different sizes and types. Often one would see prayers for the increasing of lungta or one’s fortune, prayers like om mani padme hum hoisted for the deceased and prayers like Vajra guru hoisted for overcoming obstacles, among other prayers. Prayer flags also come in many colours, normally printed in black ink on white cloth which is the simplest form. Often, there are five colours of cloth representing the five elements, blue for sky, white for clouds or winds, red for fire, green for water and yellow for earth. Even the little stripes attached to the prayer flags comes in five colours indicating the five elements. 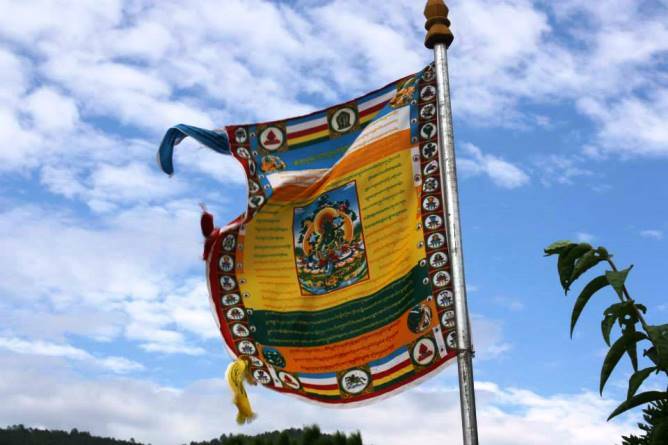 Often on the tip of the Bhutanese flag pole, one can find sword indicating wisdom of Manjushri, sun and moon disc under that for the sword to rest, and below that a lotus flower and a wheel or khorlo. Why should one hoist prayer flags? Prayer flags are a means to disseminate the blessings of the sutras and mantras. It is said that the wind, which touches the prayers, will transmit blessings to anyone whom it comes in contact with. The blessings of the sutras are carried by the wind. Traditionally, Bhutanese printed prayer flags at home using wood blocks on white cloth which is either woven or bought. Now with mechanization, not many people print prayer flags using the traditional method. Until recently, prayer flags were imported from India where they were not produced according to cultural norms and standards. Today there is a Bhutanese entrepreneur who claims to print prayer flags in Bhutan according to cultural norms and using bio-degradable materials. Where should one hoist prayer flags? One should produce prayer flags in a clean location through a tidy and culturally correct procedure. The letters, for instance, should be printed clearly without any spelling mistakes. People disagree on whether the mantras should face the pole or the far edge of the cloth. This does not really matter as long as the flag is hoisted with the mantras in the proper position and not upside down. It is important to hoist them with respect and good intention and also to have non-polluting materials for the sake of the environment. Prayer flags can be consecrated before or after hoisting although the sutras and mantras have innate power even if they are not consecrated. Normally one keeps the flags as long as it lasts. Once the prayers are totally faded or the cloth worn out, one can bring them down and properly burn them instead of trampling on it. 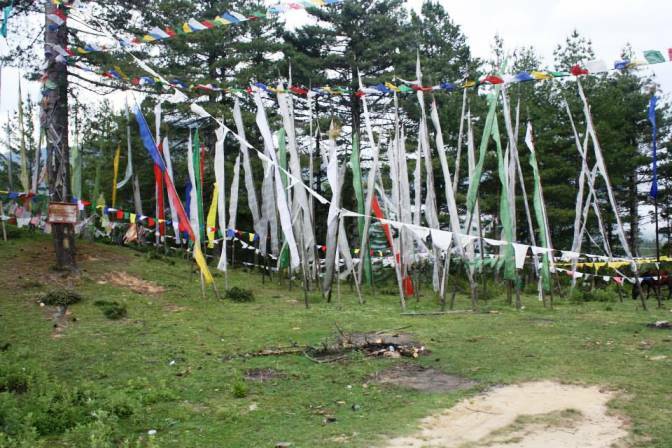 What should one think of while hoisting prayer flags? 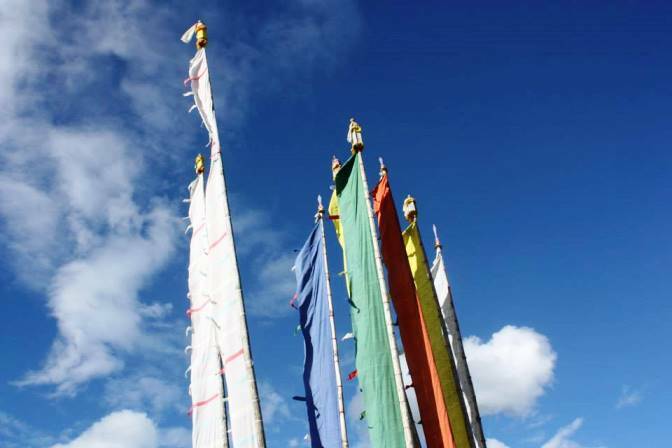 When one hoists a prayer flag, one should firstly be aware of the Buddha’s teachings because that is what prayer flags represent. One should remember the Buddha’s teaching of impermanence, non-violence, interdependence and liberation from suffering.